Shauna Lewis in Drama on 28 October, 2017. From left to right: Alex Taylor, Lizzie Strahan, Andrew Cowburn and Quasim Salam. 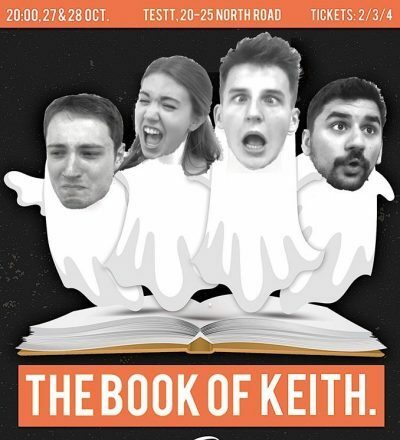 Buttered Toast’s ‘The Book of Keith’ offers consistent amusement throughout in an almost too-close-for-comfort performance space, which initially feels awkward but soon becomes an inclusive area in which the audience feel at ease with the actors. Although the acting and general commitment to keeping a straight face was impressive all around, Qasim Salam was a highlight as he jumped between steady humour and outbursts of maniacal energy. Alex Taylor meanwhile quietly stole the audience’s full attention in any sketch he walked into, which became more and more apparent as the show went on. Even incidents where the actors broke character (which was rare and brief), it only added to the spirit of the performance and didn’t even affect the audience’s reception, if anything, it only further incited fits of laughter. Musical numbers and reoccurring skits stood out as a strength of ‘KEITH’. Whilst the musical numbers in the beginning may have exerted forced energy intended to get the audience warmed up, as the show progressed they became more comfortable and relaxed. The peak of this was reached with Alex Taylor’s ‘Sketch about Love Songs’ where Andrew Coburn’s unexpected, and yet somehow completely fitting, rap contribution only furthered the hilarity. Recurring routines increased in laughter from the audience, aided by the seemingly endless reserves of energy from the actors, and as the audience required less introduction to the material they came to almost feel like an inside joke. ‘Hamlet’ as a sketch focus didn’t perhaps work quite so well, in some cases it was comedic but didn’t garner the audiences favour as much as the other pieces. This could be perhaps due to the subject matter which felt like an attempt to be smarter than the audience and demonstrate the sophistication of the writing of ‘KEITH’, which was witty enough without reference to 17th Century drama. Similarly, not fitting in to the repertoire, the punchline on ‘Undercover Boss’ took slightly too long to set up and didn’t work quite so well as the fast-pace of the other sketches, such as in the case of the ‘Flyer’ sketch which was so simple and easy to establish. The technical issues addressed by the actors at the end really were not an issue at all, in fact the music in between sketches was sometimes rather jarring, with the music being rather abrupt with the stopping and starting. Instead, the dimming of lights worked as a smoother transition between scenes as it maintained the atmosphere of the show to a better degree, for the amusement of the audience went uninterrupted. This comedy is one to watch if you have the chance, and the group is definitely one to look out for over the coming year. The swift movement of the show and the close proximity of the actors ensures your attention cannot stray throughout and when it draws to its conclusion you find yourself surprised by how quickly the show has gone, and for lack of better phrasing, it leaves you wanting more.